The Koran states that men and women were created as equal. One of the fundamental aspects of Islamic equality has its roots in the story of Adam and Eve. Both Adam and Eve (Hawa in Arabic) are equally responsible, when they both eat from the forbidden tree. The Koran uses the Arabic dual form to illustrate their shared culpability. The Koran states that “Satan caused both of them to stumble.” Both Adam and Eve repented, and both were forgiven and begin a new shared destiny on earth. The equality in the Islamic Adam and Eve story undermines the entire discourse that says women are inferior or secondary to men. There is no notion that women were created for men. The verse: “Women have the same rights (in relation to their husbands) as are expected in all decency from them, while men stand a step above them” (Koran 2:228) has mistakenly led to some believing in male gender superiority. But this verse specified the degree of responsibility, not privilege, in a man’s role as provider, protector, and maintainer of the family. The hadith is the sayings, actions and teachings of Prophet Muhammad. Women had the right to vote and to political and civic participation. Women could participate in the military. During the Battle of Uhud, Umm Umara Nusaybah bint Ka’ab valiantly defended the Prophet Muhammad on the battlefield, sustaining 12 wounds in the process. Islam ensured women their property rights. If a woman owned any property before marriage, she retained that property after marriage. In context, women did not have the right to own their own property in Europe until the 19th century. Muslim women retained their own surname and did not have to adopt that of their husband. Muslim women had the right to divorce instantly on returning the dowry. In Sharia (Islamic religious law) the husband has to agree for the divorce to take place (unless she has a prenuptial agreement). Muslim women gained full ownership over their money, while husbands had the responsibility to provide for them. Muslim women have historically, although mostly exceptionally, held leadership roles. The Koran mentions the Queen of Sheba, named as Bilqis in Islamic commentaries, who displays wisdom and intellect in her leadership. For most of his life, the Prophet had only one wife, Khadijah, until she died. She was a businesswoman and proposed marriage to the Prophet Muhammad. She was the first person who believed his initial revelations were legitimate. His next wife, Aisha bint Abi Bakr, was a scholar and teacher, and famously led an army in the Battle of the Camel, to avenge the death of the third Caliph, though she later regretted this action. Women have also held political leadership roles in countries like Indonesia, Egypt, Senegal, Afghanistan, Pakistan, and Bangladesh. In 622, Prophet Muhammad built the first mosque in Medina. The Muslims migrated here from Mecca where they faced persecution. Men and women prayed in the same space in the Prophet’s Mosque of Medina, without a barrier. Women and men have the same obligations in worship. The only difference lies in where they perform the Friday congregational prayers, known as “Juma”, held after midday: women are not obliged to attend congregational Friday prayers, whereas men are. However they have the option to attend. Mosques in most Muslim countries serve both male and female worshippers. In China, female-only mosques have existed for centuries. While most mosques in the UK serve both men and women, nearly a third of mosques in Britain do not accommodate women. Some mosque committees (largely from the South Asian communities) believe women should not pray in a mosque, but rather at home, even though, Islamically, women were active members of the mosque 14 centuries ago. In the vast majority of mosques, men and women sit separately, the women pray in rows behind the men if they are sharing the same space. During the pilgrimage in Mecca, men and women may walk side by side in front of the Kaaba and may pray next to each other, but generally prayer is in designated spaces. Generally, women can lead female-only congregations. For the majority of Muslim societies, a female imam cannot lead a mixed congregation of men and women, partly due to the reason that women are to pray behind men so that their form is not looked upon when they bow down and prostrate. 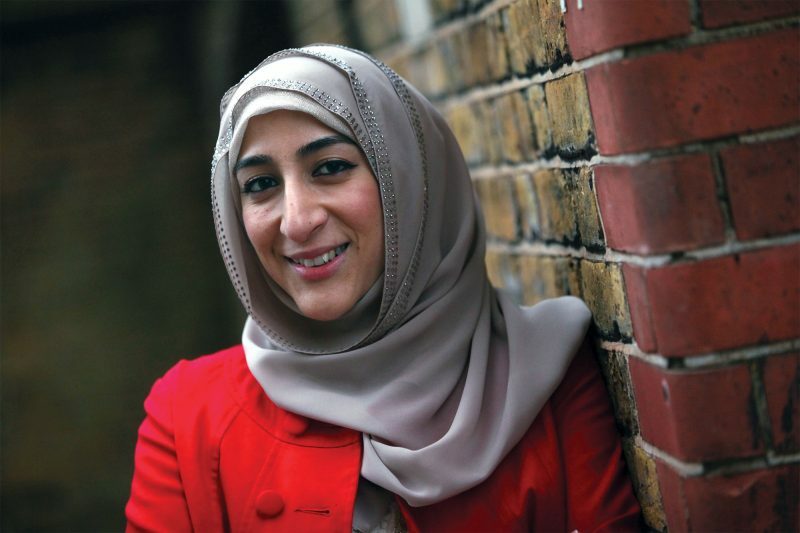 There has been some debate around whether a female imam can lead a mixed congregation in prayer. This has formed largely around a prophetic narration concerning Umm Waraqa, whom the Prophet appointed as a female imam. Umm Waraqa knew the entire Koran by heart and was instructed by Muhammad to lead a prayer congregation for the “people of her home”. The Arabic word for home, “dar”, can refer to one’s residence, neighbourhood, or village. The people of Umm Waraqa’s home were so numerous that Muhammad appointed a muezzin to call them to prayer. Some modern scholars have said that a knowledgeable woman could lead a mixed prayer in her home. The American-African Muslim scholar, Amina Wadud, who is known for her progressive reading of Koranic exegesis, led a mixed-congregation for Friday prayers in the United States in 2005, which drew both criticism and some support. But the vast majority of Muslim scholars do not allow females to lead mixed congregations in prayer. The guidelines around modest dress differs for men and women. For some women, it can extend to covering more parts of the body, including the hair. Muslim women interpret modesty in their own diverse and unique understandings as a form of self-expression. In seventh-century Arabia before the revelation of the Koran, the khimar was worn to cover the hair but was tied behind the neck, leaving the upper chest bare. This verse ordered that the khimar now be drawn over the chest, so that the neck and chest were not exposed. The consensus of Muslim scholars is that the headscarf is obligatory, yet some critics believe that covering the hair is not required in 21st-century western society. The hijab is worn in front of non-related males. The hijab is not worn in front of male relatives, like fathers, brothers, sons, uncles, grandfathers and so on, or in front of women and children. A niqab is a veil that covers the hair and the face, leaving the area around the eyes uncovered. The niqab is not mentioned in the Koran and the overwhelming majority of scholars say that the niqab is optional at most. Some hadith stated that the Prophet Muhammad himself taught women they need not wear a niqab. “When a woman reaches the age of puberty, nothing should be seen of her except for this and this [pointing to the hands and the face]” (Narrated by Sunan Abu Dawood). When on pilgrimage to Mecca, it is forbidden to wear a niqab. The niqab has been worn culturally by women for centuries mainly in the Arabian Peninsula. Many interpretations of Islamic texts have been influenced by restrictive patriarchal readings, oppressive cultural customs and social context. The message of justice and equality in Islam does not match up to the daily realities that Muslims women face. Misogyny is a factor in many Muslim communities. Women face an abuse of divinely sanctioned rights, along with facing the obstacles of social and cultural barriers. In contrast to the Koranic verse, “There is no compulsion in religion” (Koran 2:256), and in contrast to the Islamic principle of freedom, women’s dress and rights have been state imposed in some Muslim countries, such as Saudi Arabia and Iran. Polygamy existed in many cultures and religions, but Islam sought to limit the practice rather than promote it. This verse was revealed after the Battle of Uhud in 624, between the Muslims and their Meccan oppressors. The battle claimed the lives of many Muslim men, leaving behind widows and orphans. Today, monogamous marriages are the norm among the vast majority of Muslims. Mary is a highly respected figure in Islam as a woman of great piety, honour and dignity. She is the only woman named in the Koran and there is an entire chapter named after her. In the Quran, Mary is not referred to as the “mother of Jesus”, it is Jesus who is referred to as the “son of Mary”. The Koran states that Mary was “chosen and purified” by God. It also states: “And when the angels said, ‘O Mary, indeed God has chosen you, purified you, and chosen you above the women of the worlds’.” (Koran 3:42). Khadijah bint Khuwaylid was Prophet Muhammad’s first and most beloved wife. Khadijah was a successful businesswoman and was the first to accept Islam. She was Prophet Muhammad’s chief adviser and foremost supporter. She gave her wealth to the poor, orphans, widows and the sick. Asiya, the wife of the pharaoh who ruled in the time of Moses, is praised in the Koran and mentioned in hadith as one of the four greatest women. Aisha bint Abu Bakr, the wife of the Prophet, held extraordinary intellect and knowledge in various subjects, including poetry and medicine. She is the third greatest hadith collector, known for narrating 2,210 hadiths. She served the Muslim community for 44 years after his death. Fatimah, the daughter of the Prophet, whom the Prophet loved dearly and Muslims respect highly as one of the four leaders of women in paradise. Umm Darda, the seventh-century jurist and scholar from Syria. She taught imams, jurists, and reportedly taught the fifth Umayyad caliph. She is one among a rich but lost legacy of female scholars in Islam. A modern-day Oxford based Indian male scholar, Shaykh Akram Nadwi, discovered over 8,000 accounts of female scholars, who were experts in theology, law, philosophy and calligraphy. Rabia al-Adawiyya, born in eighth-century Basra, was the first female Sufi saint. Rabia was arguably the most influential Sufi woman in Islamic history, influencing centuries of Islamic philosophy and mysticism. Fatima al-Firhi, the daughter of a wealthy merchant, established the world’s oldest existing university of al-Quaraouiyine, in Fez, Morocco, in 859. She also founded one of the world’s oldest libraries in the university. Lubna of Cordoba, the 10th-century Andalusian mathematician, poet, grammarian and copyist. She was the palace secretary of Caliph Abdul Rahman III and his son al-Hakam ibn Abdul Rahman. She headed the royal library, then the world’s biggest, which contained more than half a million books. Razia Sultana ruled the Delhi Sultanate from 1236-1240, the only woman to do so. She encouraged trade, built roads, supported the arts, constructed schools and libraries, and sought to protect her Hindu subjects. Zainab, daughter of Ali (the fourth caliph of Islam), was a knowledgeable teacher of the Koran and powerful against the tyrants of her time, living through oppression and tyranny in Karbala. Zubayda bint Abu Ja’far, born in eighth-century Baghdad, was the wealthiest and most powerful woman in the world of her time. She was the wife of Harun ar-Rashid, the fifth Abbasid caliph. She developed buildings in cities, and established wells, reservoirs and artificial pools all the way along the pilgrimage route from Baghdad to Mecca. She was also a patron of the arts and poetry.